This week I went to an event held by the University of Kentucky Department of Sociology about chocolate. I’ve been to a lot of lectures, but this one was pretty awesome because there was also a chocolate tasting. 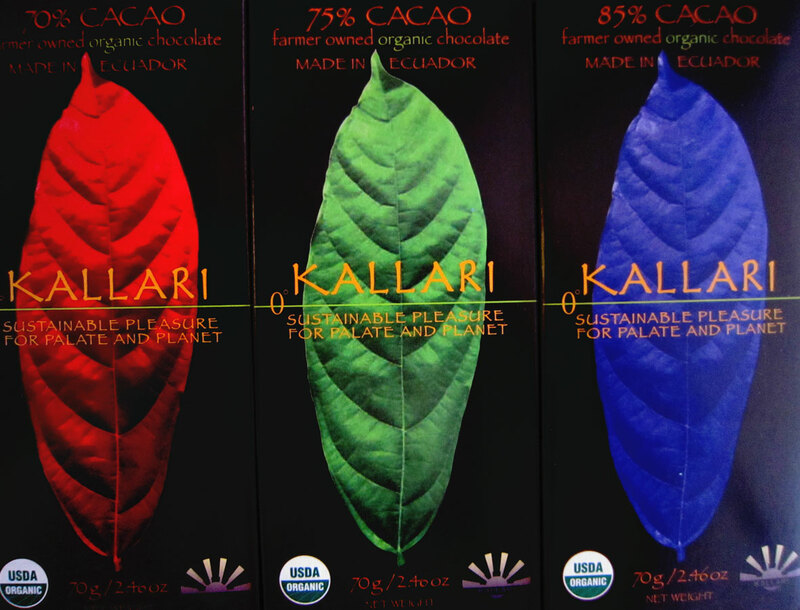 The event was called Beyond Fair Trade: The Story of the Kallari Chocolate Cooperative. Judy Logbeck was our guest for the evening. I suppose she has worked with people in the University of Kentucky’s Sociology Department, who have traveled to Ecuador to to the Kallari farm. For the tasting, we were given 13 different types of chocolate. The first three, were cacao nibs, real cacao powder, and cacao butter. The beans are roasted, then cracked open, and this is what the nib is. It’s the raw version of chocolate. It’s then ground into a paste, where it’s called cacao, cacao mass, or cacao liquor. It can then be mixed with an emulsifier, sugar, milk, or other things to make chocolate. Or it can be separated into cacao powder and cacao butter. 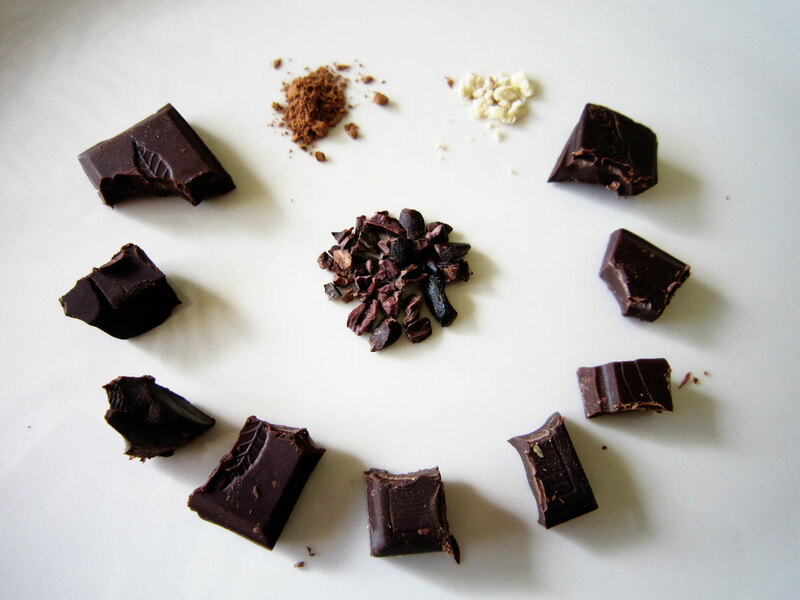 The next 10 pieces of chocolate ranged from 70% to 85% dark chocolate. They were all quite different, and most of the group agreed with which ones agreed with our palette best. Of course, it was the higher quality chocolates. Overall I liked the Kallari 70%. You can find Kallari at Whole Foods. The worst one we tried was the Green and Blacks, which is owned by Kraft. All of these bars range around $3-$6 per bar. I figured it’s worth it to buy what you like and buy the good stuff, that’s going to benefit the workers of the cacao farms. All of these chocolates tasted different in many ways, some had more of a citrus taste, some more earthy or like wood. Others were sweeter, or more bitter. After going to this lecture, I’m going to start making different choices when buying chocolate. Beyond tasting some great chocolate, I learned a lot about the process and ingredients in chocolate, and what growing the cacao bean does to the countries in which its grown. Center are the cacao nibs, above cacao powder & cacao butter, surrounded by the rest of the chocolates tasted. Here are the major points learned. 2. Milk chocolate was created in Switzerland to use up all the excess milk made in the summertime. They found when it was mixed with sugar and the antioxidant abundant chocolate, it lasted for a really long time. 3. Soy Lecithin (derived from soy) is used in chocolate as an emulsifier which makes the chocolate fluid enough to move through the factory’s machines at a fast pace, for quick production. The better stuff, cacao butter, is 50 times more expensive, and is 4 times as thick. 4. Major coffee producers (and Starbucks), over-roast all of their coffee. They do this so they can buy whatever bean is the cheapest and most available, from sources all over the world. By over-roasting it, they can create a consistent tasting coffee, which makes people okay with what they’re drinking. If they started having lighter roasts, then people would be able to distinguish what bean they liked better (and would demand it more), which in turn would give more power to the farmer of that particular bean (and Starbucks would have to pay him more). Same way can go for chocolate beans. But over roasting kills many of the health benefits of beans. 5. Milk chocolate is only 5%-20% cacao. It’s mostly milk and sugar. A Snickers has no chocolate about it. 6. In the US, if a bottle of olive oil says it’s from Italy, only 5% has to come from there. In chocolate, it’s only 15%. So if a bar says, “Made with Venezuelan cacao” only a small percent could have actually come form there, and the rest could be a less quality cacao, or filler. 7. Dutch Processed chocolate is alkalized, heated at higher temperatures, which kills more of the antioxidants found in chocolate. This higher temperature, like coffee, allows a cheaper bean to be used, because it’s just has a more roasted taste. 8. Cheaper chocolates add fillers into the chocolate, like parts of the shell from the bean, which adds more fiber to the chocolate, and less taste. 9. The worst cacao beans are sent to the US. The Europeans will pay more for better chocolate, where here in the US we don’t want to pay as much for chocolate, at least not yet. Even the same brand of bar sold in the US as in Europe will be made of poorer chocolate. 10. Don’t chomp on dark chocolate, because it will seem bitter. Let your tongue melt it. If you rub the chocolate a bit, it will open its pores and allow it to have a stronger aroma.